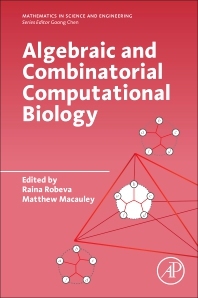 Algebraic and Combinatorial Computational Biology introduces students and researchers to a panorama of powerful and current methods for mathematical problem-solving in modern computational biology. Presented in a modular format, each topic introduces the biological foundations of the field, covers specialized mathematical theory, and concludes by highlighting connections with ongoing research, particularly open questions. The work addresses problems from gene regulation, neuroscience, phylogenetics, molecular networks, assembly and folding of biomolecular structures, and the use of clustering methods in biology. A number of these chapters are surveys of new topics that have not been previously compiled into one unified source. These topics were selected because they highlight the use of technique from algebra and combinatorics that are becoming mainstream in the life sciences. Raina Robeva was born in Sofia, Bulgaria. She holds a PhD in Mathematics from the University of Virginia and has broad research interests spanning theoretical mathematics, applied probability, and systems biology. Robeva is the founding Chief Editor of the journal Frontiers in Systems Biology and the lead author/editor of the books An Invitation to Biomathematics (2008), Mathematical Concepts and Methods in Modern Biology: Using Modern Discrete Models (2013), and Algebraic and Discrete Mathematical Methods for Modern Biology (2015), all published by Academic Press. She is Professor of Mathematical Sciences and Director of the Center for Science and Technology in Society at Sweet Briar College. Matthew Macauley is an Associate Professor at Clemson University in South Carolina. Since finishing his PhD in Mathematics from the University of California, Santa Barbara, he has been a research visitor at the Biocomplexity Institute of Virginia Tech, the Institute for Systems Biology in Seattle, and the University of Southern Denmark. He has also taught internationally in both South Africa and Taiwan. Macauley has supervised two PhD and five MS students, as well as a number of undergraduate research students. With Raina Robeva, he has co-organized three faculty development workshops on teaching discrete and algebraic methods in mathematical biology to undergraduates.